My husband introduced me to my love of birds, then I found butterflies, and finally I found native bees. When you create a pollinator friendly yard, you too will find all of these co-existing. It is amazing to me that there are over 4000 species of native bees in North America, from the large bumble bees (Bombus) to the gnat sized Perdita. 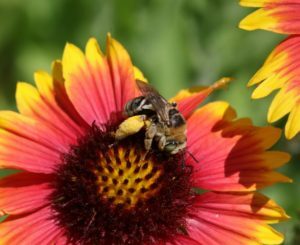 Digger bee on Indian blanket flower. The honey bee, which receives a lot of press due to bee colony collapse, is actually a European bee and not native; although, the plight of the honey bee has drawn a lot of attention to the losses we face for bees in general. In 2017, the rusty patched bumble bee was added to the Endangered Species List, which is yet another indication that bees and other pollinators are in trouble. So, what can you do to help this situation? Well, one thing is to provide habitat for pollinators and that in turn will help birds, butterflies, and bees and a lot of other insects. Pollinators need the same basic things that we do: food, shelter and water. Let’s start with food. Pollinators need both nectar-providing plants and host plants. Nectar provides sustenance for our butterflies, bees, wasps, flies, and hummingbirds. All butterflies and moths require host plants for their caterpillars to feed on, so it is important to include host plants mixed in with your nectar plants. The butterfly most people know about is the Monarch which requires milkweed (Asclepias spp.) as a host plant for its caterpillars. The Monarch only lays eggs on milkweed, and its caterpillars only eat milkweed. Other host plants that are common to our area are Spicebush (Lindera benzoin,) which is the host plant for the Spicebush caterpillar (one of my favorites); Passion flower (Passiflora spp. ), host for Fritillaries and hairstreaks; Golden Alexander (Zizia aurea), host for Black Swallowtails; Pipevine (Isotrema spp. 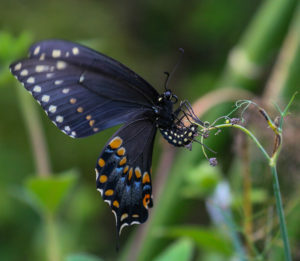 ), host for Pipevine Swallowtail; and PawPaw (Asmina trilobal), host for the Zebra Swallowtail. These are the larger and more visible butterflies, but there are many others! Black swallowtail laying eggs on host plant. Many of our butterflies and moths’ host plants are our trees including Oak species, Sassafras, Tulip-trees, Maples, Willows and more. Some of our best nectar plants are also trees such as Tulip-trees, Sourwood, Black Cherry, Serviceberry, and Dogwood. For more perennials, shrubs and trees please refer to: “Creating Your Pollinator Garden” for a list of nectar and host plants. 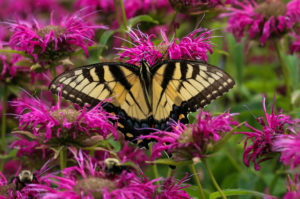 Choose a variety of nectar plants that will bloom throughout the season from March to October. Different pollinators are active at different times of the year, and you need to provide nectar across all their active seasons. Cluster plants of the same species. This will make it easier for both pollinators and caterpillars to feed and graze. Include various colors and sizes of blooms. Different pollinators prefer different colors and remember that insects see plant colors differently than we do. Smaller pollinators prefer smaller flowers such as some of the native mountain mints, while bumble bees may prefer penstemons and flowers only they can pollinate. Include native grasses to add structure to your garden and places for caterpillars to put their chrysalis. There are also a number of butterflies whose host plants are native grasses. Don’t be upset when caterpillars eat your milkweed or other host plants – this is what the host plants are there for, and it means your garden is a success! The majority of these plants are not affected and grow back. Gray hairstreak and wasp on goldenrod in fall. Don’t use insecticides and ask when you purchase plants if they have been treated with a neonicotinoid. Neonicotinoids are absorbed by plants and can be present in pollen and nectar making them toxic to bees for many years after the treatment. For more information see the Xerces Society’s “How Neonicotinoids Can Kill Bees”. Even insecticides labeled as organic can kill pollinators, so read all labels for anything used in the garden. Start small and add to your garden over time. The more diversity in plant species the more diversity you will find in the insects in your garden. Predators in the garden are a good sign that you have a healthy yard. You need a full range of insects to have a healthy ecosystem in your yard and that includes the predators both small and large. 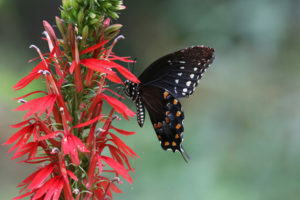 Spicebush swallowtail on Cardinal flower. While people are familiar with honey-bee hives and colonies, most of our native bees are solitary nesters who may nest in the ground or in a woody plant. In fact, 70 percent of native bees nest in holes in the ground, and those that don’t nest in the ground will nest in hollowed-out twigs, pock-marks in rocks, and holes in trees. The female bee will prepare a nest and provide the larvae with a combination of pollen and nectar to eat once they hatch. Therefore, it is important to provide sunny south or east-facing areas of exposed earth for these bees. Don’t be alarmed if you see a number of holes in the grounds and bees entering and exiting. Solitary bees don’t attack, and most don’t have stingers. Only bees that live in colonies such as honey-bees and bumble bees will protect a nesting site. You can provide piles of sticks or bee houses which will be used by a number of different pollinators. If you choose to use a pollinator nest house it is best to place it facing the morning sun, so the nest site does not get too warm. You will also want to replace the box every few years to prevent infestations of pests in the wood. 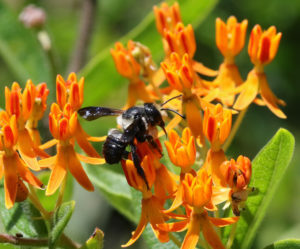 Native bee on Butterfly weed. Bees and other pollinators will also need water which is best provided in a very shallow dish or a dish with rocks, so they do not drown. For more information on our native bees, I recommend this book: The Bees In Your Backyard – by Joseph Wilson and Olivia Carril.